SHADOW PLAY is the full and frank account of the events that led to the slaughter of up to a million people in Indonesia. On the night of September 30, 1965, six of Indonesia's senior generals were dragged from their beds and brutally murdered. The murders set in motion a power struggle that would lead to the overthrow of President Sukarno by General Suharto. SHADOW PLAY looks at how Western powers manipulated key figures in Indonesia to keep Southeast Asia from falling into communist hands. At the heart of the story is Achmad Sukarno, the dynamic figure who led the Dutch East Indies to independence. 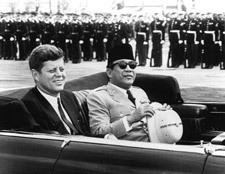 Sukarno's courting of the Indonesian Communist Party (PKI) rankled Western powers. With the establishment of the British state of Malaysia on Indonesia's border and the escalation of the U.S. military campaign in Vietnam, Indonesia and the West became increasingly polarized. Then, on September 30, junior army officers supposedly under control of the PKI killed the generals. Twenty-four hours later, General Suharto put down the 'coup.' In the weeks that followed, Suharto's powers grew, extending to the control of the press, which spread stories of communist women torturing and mutilating the generals. Soon a nationwide purge was on, leading to mass arrests in Jakarta of anyone with even tenuous ties to the PKI. In the countryside tens of thousands of people were tortured, shot, and buried in mass graves. Six months after the murder of the generals, with hundreds of thousands of Communists and their alleged supporters dead, General Suharto deposed President Sukarno and began a dictatorship that would last until 1998. Looking back on that pivotal year, SHADOW PLAY examines how British propaganda specialists worked with General Suharto to whip up anti-Communist sentiment and solidify the army's position as heroes. It also reviews newly released communiqués from U.S. and Australian ambassadors. These documents reveal that Western powers allowed Suharto to carry out mass murders so that the Indonesian domino would fall on the Western side of the Cold War divide. Indonesia is still fractured by the events of September 30, 1965. Mass graves are being opened and bodies exhumed for the first time. One of them belongs to Ibnoe Santoro, a student who was executed and dumped in a hole. His brother, Joyo Santoso, finally feels free enough to talk about what happened. But, as his family and others seek to re-bury the bones of their murdered relatives, many Indonesians violently refuse to allow it, for they are still wary of Communism and those with alleged ties to the PKI. Also interviewed is Dr. Sumiyarsi, now in her seventies. She was arrested without warrant, detained without trial, and imprisoned for 11 years for allegedly being associated with the PKI. "My only crime was that I was a member of the Indonesian Scientists Organization," she says. Through recently declassified documents, interviews with newly liberated Indonesians, and discussions with officials, journalists, and survivors of prison and torture, SHADOW PLAY offers a startling new interpretation of the events that shaped modern Indonesian history and changed the destiny of Southeast Asia. In the Solomon Islands extensive logging forces the Haporai people to confront social, cultural and ecological disintegration.